The new academic year brings in renewed energy and strengthening of our resolve to fulfil all that has been planned for the students. There are new goals to identify and dreams to be turned into reality. The law of nature says “Change is important and exclusive”. We are determined to chart a new path for ourselves destined to achieve success. 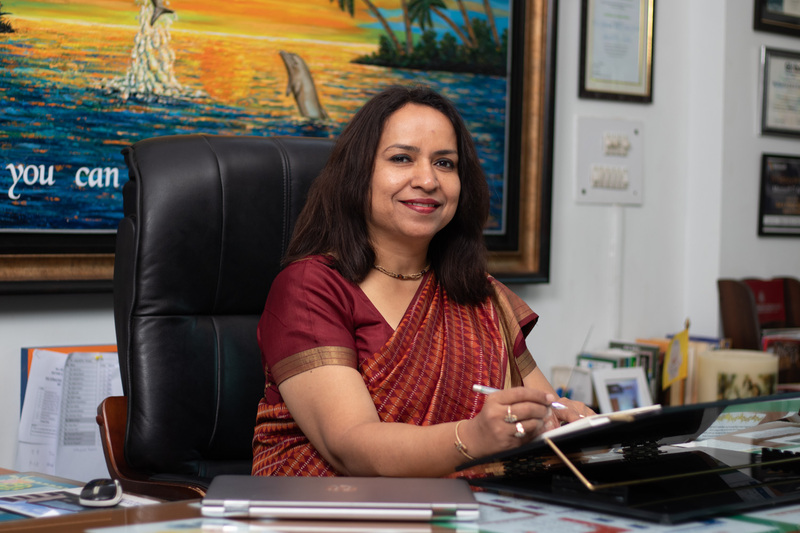 It gives me immense pleasure to welcome dear students and parents to the new academic session - 2019-2020 with a definite assurance that you will find the school atmosphere convivial with an energetic environment, conducive to learning and growth. I’m excited and looking forward to working closely with all stake holders – teachers, students and parents to effectuate excellence in school education. Improvement is a never ending process. Strong desire and will to improve makes us alert, open and prepared to welcome new challenges, explore new possibilities and unite for common success and excellence. Our good character is the foundation of our personality and destiny. So my message to my students is to set new goals, well in advance for the future, plan the targets to be achieved as Vivekananda has rightly said, “Arise, awake and stop not till the goal is achieved.” Our dreams will only take shape if we are focussed and fill our minds with positive attitude and thoughts towards a change. It is the most auspicious time- the beginning of the new session. It’s the time when each one of us enters the portals of School-with a new dream and hope. Dear Teachers, you need to understand that we need to be flexible to be able to change the way we do things as each year we cater to a more tech savvy, aware and critical set of students. Inconsistency in expectations and consequences can lead to dysfunction in the classroom. Dear Parents, kindly keep your Student Information Verification forms up to date with new phone numbers and addresses. Any changes or additions to student information should be notified as they are crucial for the safety and comfort of your child. If your address changes, contact the school office ASAP so that changes related to bus routes can take place at the earliest possible. Additionally, if your child is absent from school please ensure that a note is send specifying the reason for your child’s absence (sickness, weather or family emergency). Dear Parents, during the School Year there will be a variety of special activities and celebrations. I encourage you to support them by giving the required cooperation. Your support will make your child feel important and send the message that you value School. Please check the School’s website for the upcoming events, calendar, information and results of activities performed on school premises. In case you want to meet me, kindly fix an appointment through our Front Office Executive or school mail (school@davdwarka.in). I will appreciate if you mention the agenda for the meeting in your e-mail so that I work upon it to resolve, close or follow it up on a positive note. Have a wonderful and exciting school year ahead!